How Does a Dandelion Grow? The common dandelion is considered by many gardeners to be a nuisance, although it is frequently cultivated and harvested for its nutritional properties. A mature dandelion appears as a small, delicate flower with bright yellow petals and a bloom that is about as large in diameter as a U.S. quarter. This bloom closes after each sundown and reopens at dawn until the dandelion begins to dry out, at which point the petals begin to fall off. As the petals drop, they are replaced with white, wispy pappi, each of which is attached to a dandelion seed. The pappi grow into a delicate sphere and each one releases its seed to the wind or other forces with little resistance. 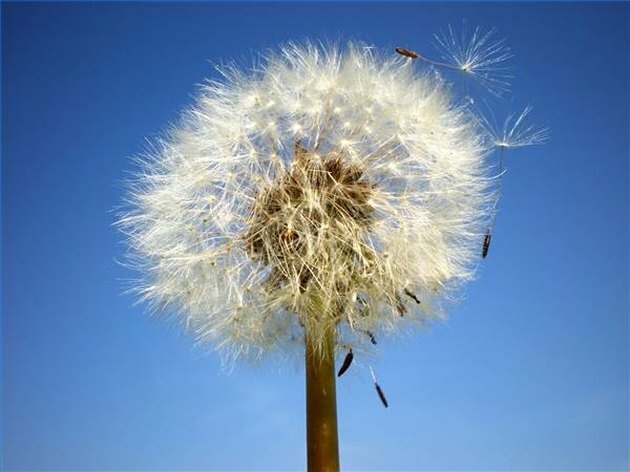 Dandelion spreads when a weed reaches the end of its bloom cycle and the pappi appear. Sometimes all it takes is a slight gust of wind to dislodge a few pappi and send them airborne. The fine hairs of the pappi allow seeds to travel great distances with the help of sustained winds. They can also help seeds attach themselves to animals, insects, humans or other objects that may come into contact with rooted dandelions or airborne seeds. The pappi cannot adhere themselves strongly to anything, though, so they typically travel only a short distance before dropping off again. Every seed that is carried away from its source by any means has the potential to produce another weed if it lands in or near soil that is fertile on any level. When gardeners cultivate dandelion for future harvesting, they typically sow the seeds directly on the soil's surface. This is because dandelion seeds are delicate and produce very shallow roots. This is the same reason why they can easily grow out of control in the wild; in most cases, a wind-borne seed just has to work its way down among a few blades of grass to reach the surface of the soil. Under temperate spring and summer weather conditions, the seeds that land in fortunate spots will germinate in fewer than two weeks. Those that germinate very early in the spring may develop mature root systems and be able to bloom before the fall, but all others will likely bloom the following spring. How Does a Dandelion Reproduce?